Flowers will never go out of style, to be sure. 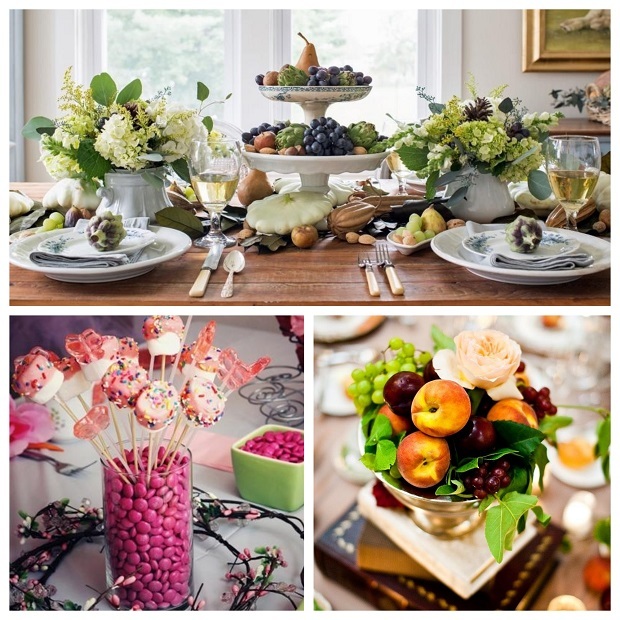 But what if you want to go a little crazy and add fun to your wedding centrepieces? One Google search and you’ll see it’s really possible to go a little crazy. We couldn’t resist it ourselves, so read on to discover our favourites. • Make them work harder with a double duty – like edible, or full of favours. • Don’t let them block the view. Guests should be able to see each other across the table without leaning or shouting. • Avoid a fire. Candles are beautiful, but always put safety before looks. The beauty of bowls is that you can fill them with anything. Our vote always goes to edible things. Why? 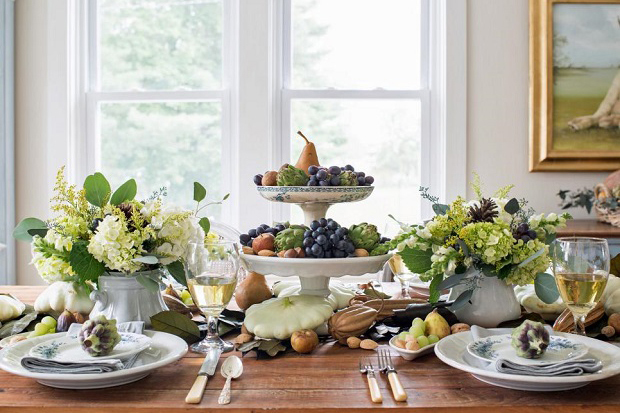 Because inevitably, many guests will arrive at your wedding hungry (it’s one of the lesser-known laws of nature). Fill the bowls inexpensively with lovely ripe apples, plums or pears, and avoid any fruit that goes mushy easily (like very ripe apricots). Or how about candy? Skittles, M&Ms, or anything snacky you can get in bulk will disappear in no time. So many good options here! How about: a bowl of Lego? If you are cost-conscious, buy it in bulk on eBay. You’ll be surprised how many people sell their used Lego by the kilo. You’ll just have to wash it (super easy and dries in no time!) and drop it in a bowl! Another option is crayons and colouring books. Just for kids, you say? No, the phenomenon of colouring books for adults is still going strong (of course, the kids at the wedding will be extra delighted). Jenga or a box of those balloons to make balloon animals will also work a treat. That’s unusual centrepiece AND entertainment for the guests! Win-win! 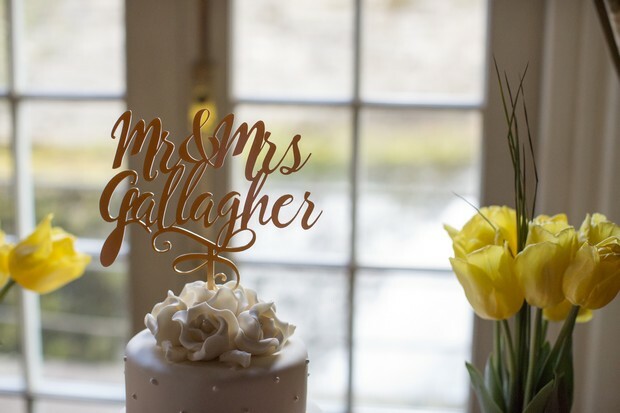 So you’ve probably seen some book lovers’ weddings, where the centrepieces are stacks of books tied together with a ribbon or a piece of lace. It looks gorgeous! Here’s a step further – make these your favours too! Choose a whole bunch of second-hand books, as many for each table as you’ll have guests. 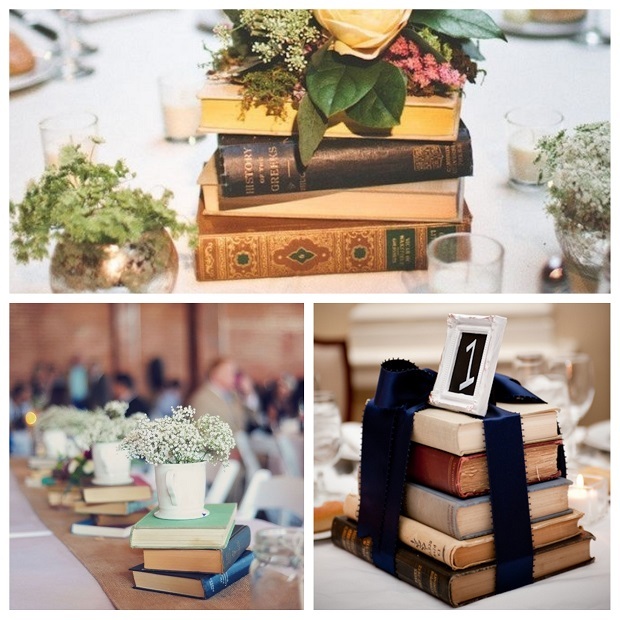 Let the guests at each table choose which book they want. Donate the leftovers to a charity shop. The books can be anything you like: your favourites, acclaimed classics, photo albums, even travel tomes. There’s so much variety, and it’s inexpensive too. Anything with a little foot under it can be a pedestal. What you put on it is the other half of fun. Again, we vote for edibles (this article is written by a foodie). Anything that can be sliced and stacked is perfect. Brownies, flapjack squares, even donuts! 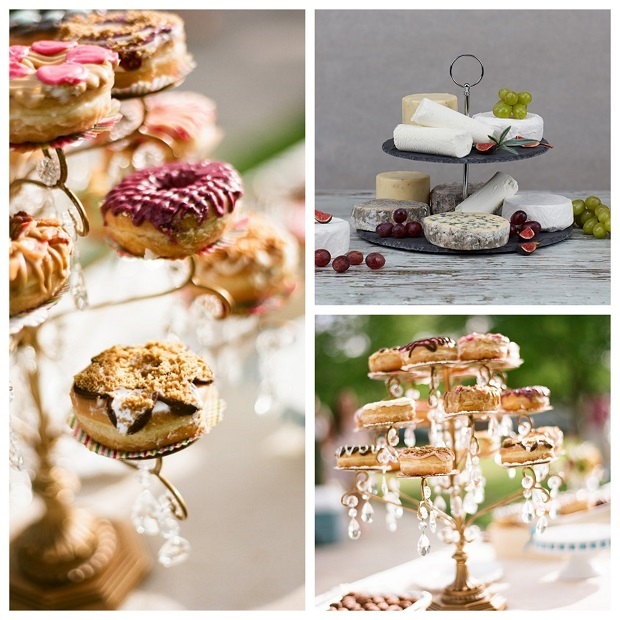 Cheese blocks (modestly sized) plus grapes are also perfect for this. If food isn’t your choice, then go for a beautiful large candle or a crowd of small tea lights. 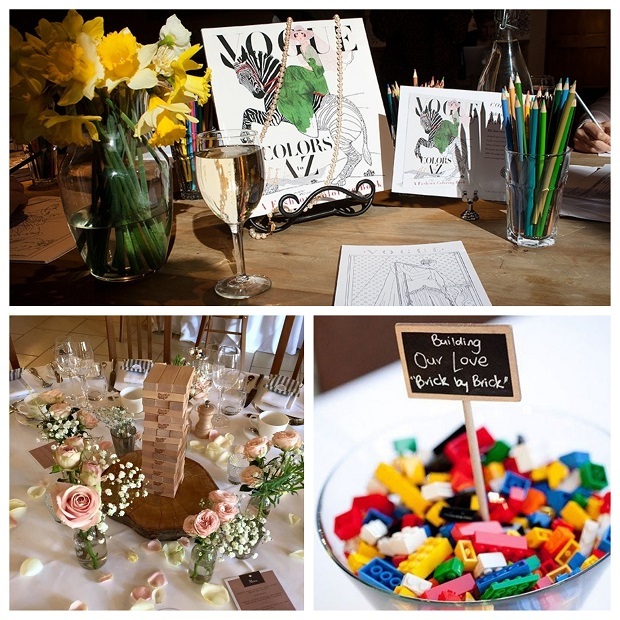 Add fun to your wedding centrepieces in an entirely different way: from above! It looks awesome, it’s unusual, and it frees up all kinds of space on the table! 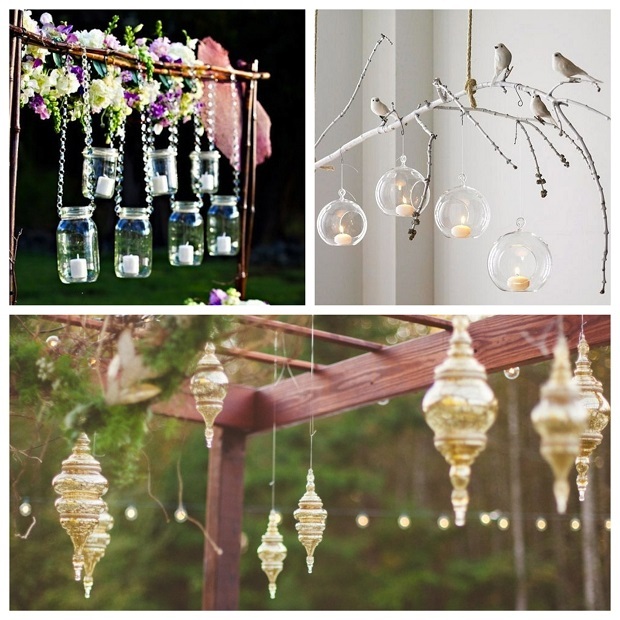 You can hang practically anything: single flowers, trendy jars with candles, stuffed birds, bells, origami shapes, Christmas baubles… basically, anything that can be hung from a string. Did we mention how awesome it looks in photos? Just make sure to check with the venue about the logistics of it, and start shopping! This is an ideal centrepiece for couples who like things to look a little different.